South Penquite is a family farm in Cornwall with three generations currently living together. 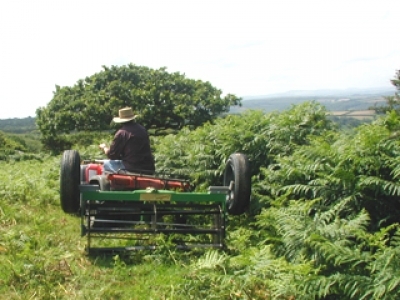 Our green journey started in 1999 when we both converted to organic farming and at the same time opened up one of our fields for camping to exploit the total solar eclipse that was to be visible in Cornwall in the August of that year. As it was, the eclipse was not visible (due to entirely predictable Cornish cloudy weather), but the camping was a great success and attracted visitors from as far afield as Madrid & New York. Our isolated setting, friendly animals and clear night skies are much appreciated by city dwellers and our tourism enterprise has since grown hand in hand with our organic venture. Once you start putting your farming under the green microscope you then start questioning everything else that you do, and so we have always tried to keep the development of the campsite on a sustainable path. This has not only kept it in sync with our farming, but has also been an attraction to ever more eco-conscious tourists. We take recycling very seriously and for instance not only do we ensure that all of the farm wastes plastics are properly recycled - but we also buy back from the same firm picnic benches and boarding made from the recycled waste for the campsite that are not only attractive but extremely hardwearing. We sell our own lamb burgers and sausages to the campers and boxes of mutton or beef to local people and a farm shop. The food miles are ridiculously low with a typical banger only travelling 20 miles from field, to abattoir, to butcher, to campfire. The only downside - or so my children constantly tell me - is my current refusal to fly on family holidays, which (until it is at the very least taxed at an appropriate level) would make a nonsense of all of our other efforts to keep our carbon footprint down. More details can be found on the South Penquite Farm website.